Yeshe Tsogyal is the founding Mother of Tibetan Buddhism, foremost female master of Tibetan Tantra. 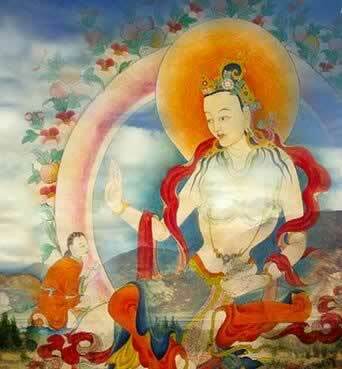 She was an eighth century Tibetan princess who became the tantric consort of Guru Padmasambhava. Her miraculous life story describes the ideal path of a yogini (a female practitioner), providing a blueprint for every woman who aspires to Buddhahood. In the Mother Essence Lineage, Yeshe Tsogyal and her incarnations and emanations are of primary importance, because she is the Mother of Vision, and therefore the Mother of non-dual experience. Although Yeshe Tsogyal is often referred to as Guru Rinpoche’s consort, the two are in fact simultaneous manifestations of the integrated principles of skillful means and sublime knowing.